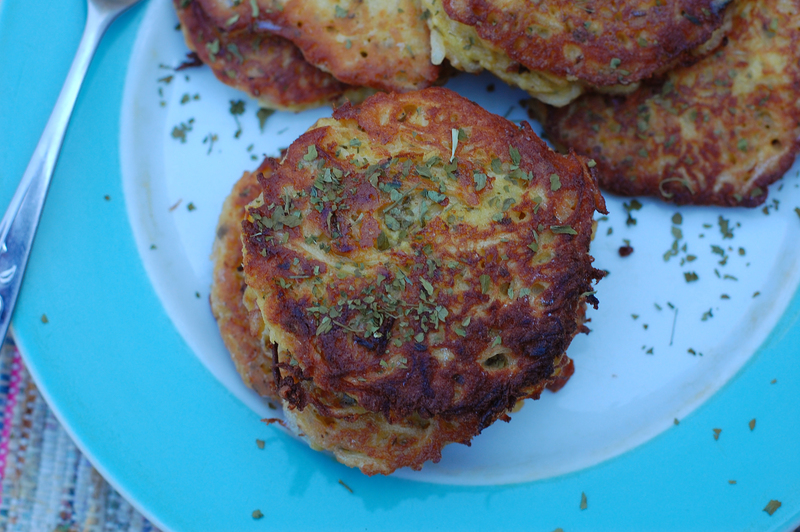 A savory treat you can make quite easily if you have all the necessary ingredients. 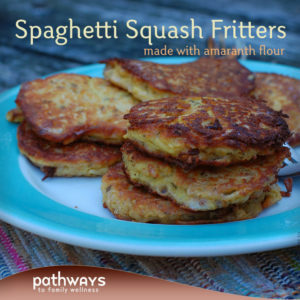 This is a great recipe after having a dinner with spaghetti squash in which you didn’t manage to eat all of it. 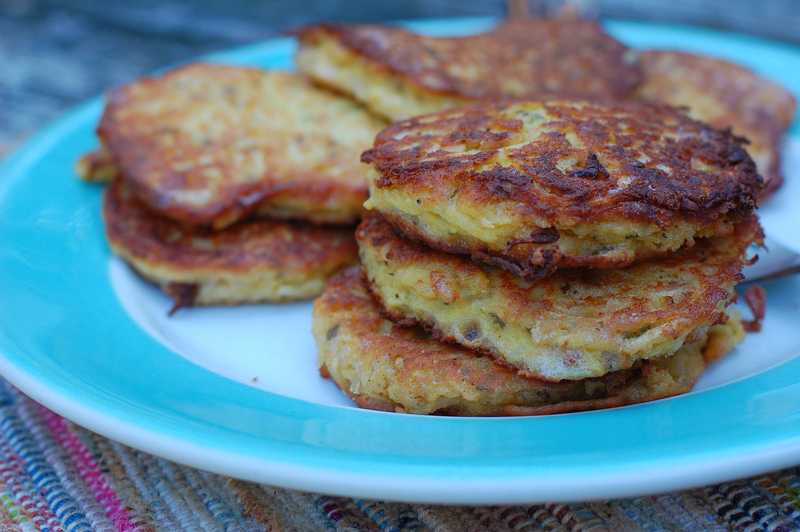 It’s the let’s-see-whats-in-the-fridge kind of recipe. I can imagine a zesty sour cream dipping sauce to accompany it. 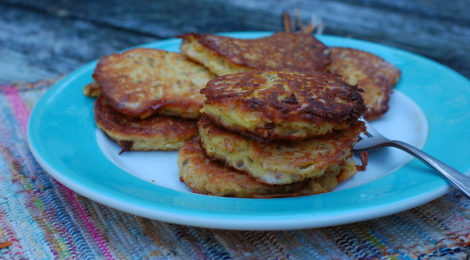 Or maybe you just want to eat them as is with tons of salt. Regardless of how you enjoy them, they are quite easy to put together. 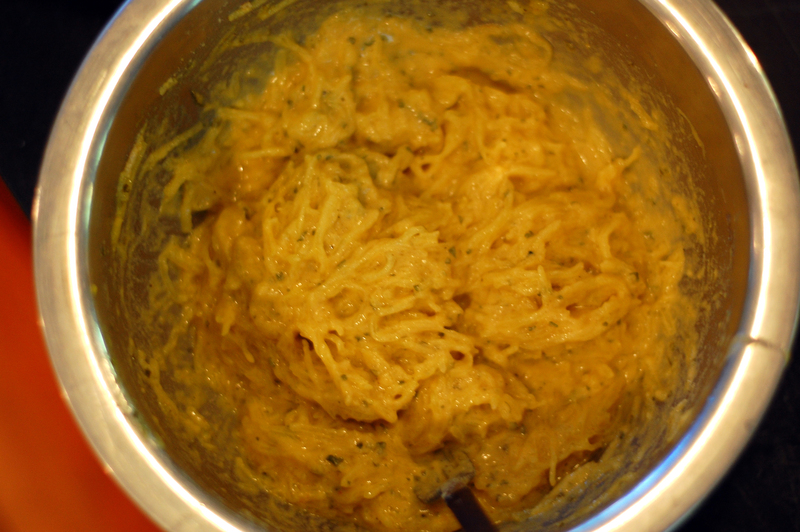 If you do happen to have left-over spaghetti squash, then you are off to a great start. 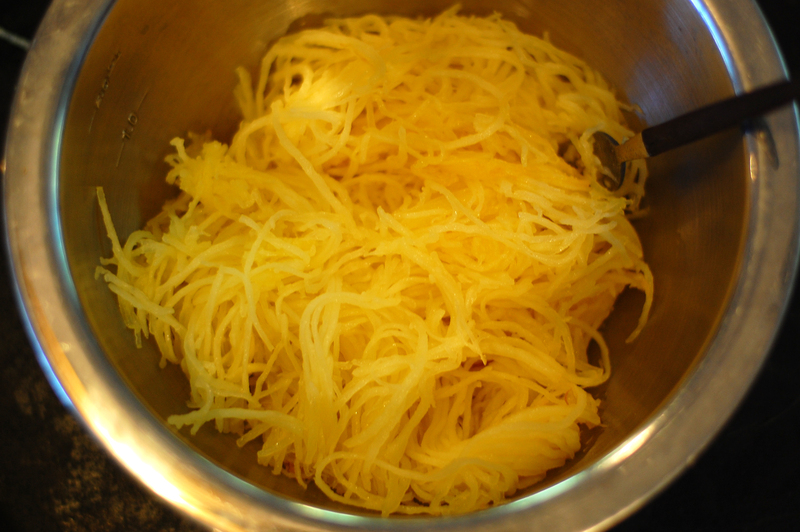 Begin by shredding the squash from it’s skin using a fork until you have 3 cups worth. Add to your mixing bowl. Use two knives to roughly cut up the squash so they are in 1-2 inch strands. 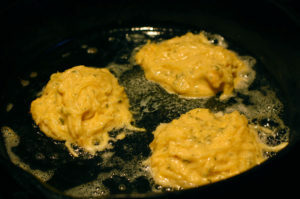 Add your eggs, flour and spices. Mix well until all your ingredients are well combined. This mixture may seem rather soupy, but it will come together while cooking. Scoop your mixture using a large spoon onto your heated, well-greased pan. 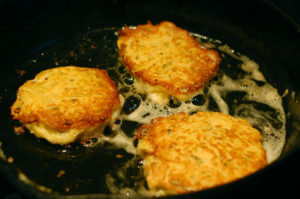 Fry your fritters, rotating and flipping until they are well-browned and cooked through; a few minutes on each side should do. Allow to dry on paper-towel or paper-bag and serve hot, or store and re-heat later. Top with fresh parsley or chives if available, and a side of your favorite dipping sauce. 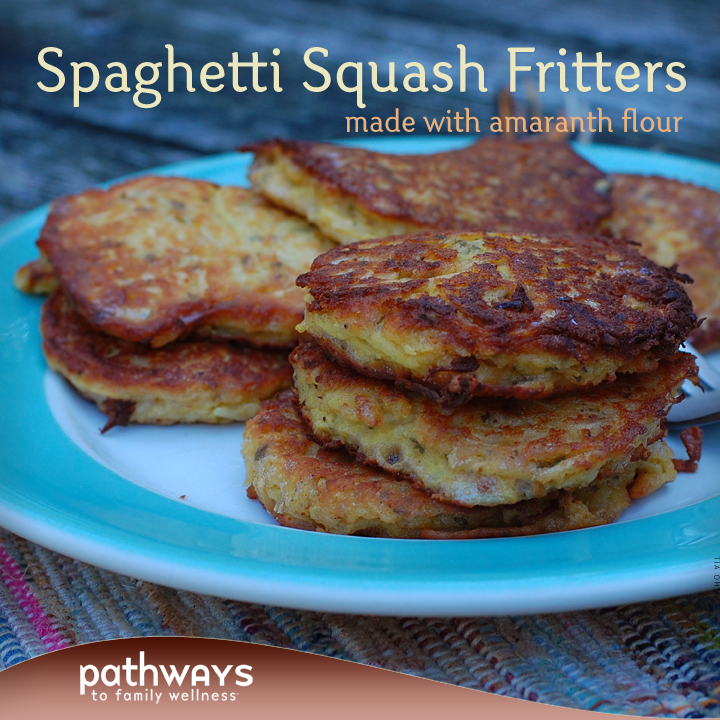 We already had cooked squash, which made this recipe so easy. 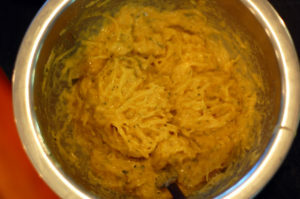 If you do not, preheat your oven to 350° and cook a halved and seeded squash in oven for about 30-40 minutes. Let cool and shred 3 cups using a fork. Combine squash, eggs, flour, garlic powder, onion powder, parsley, salt, and pepper. Mix well. Heat a cast iron skillet over medium-high flame. Melt your butter and coconut oil. 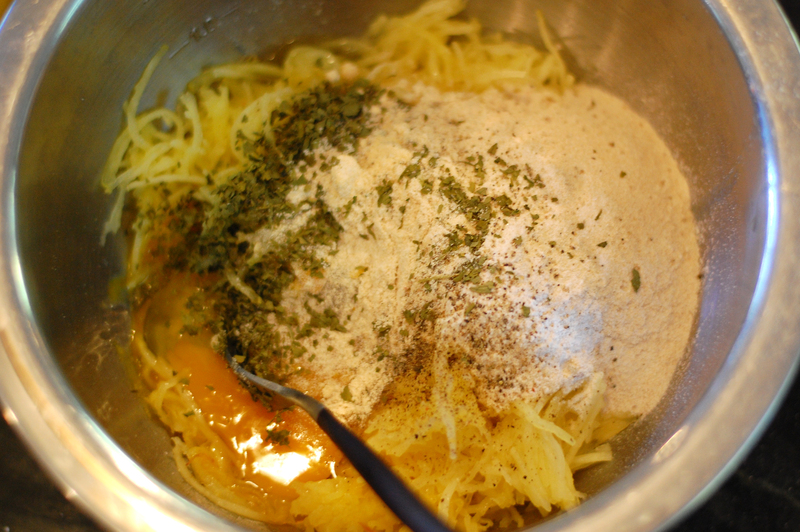 Use a spoon to scoop mounds of the squash mixture onto your heated pan. Cook on each side for a few minutes, rotating to brown all sides. Flip and repeat. Be sure to cook all the way through; you can check by cutting one in half. Place on paper towel or paper bag to cool a bit and serve.